The authors have distilled the essentials of clinical practice into a readily accessible style. Concise and practically focused, the handbook balances a pragmatic approach alongside evidence-based clinical knowledge, guidelines and protocols. This handbook is in full colour, with even more images and diagrams to aid understanding. It has been fully updated with sources and further reading, including the most up-to-date e-learning and web resources. 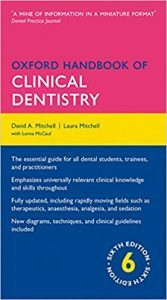 The handbook includes revised chapters on fast-moving areas of dental practice such as therapeutics and anaesthesia, as well as updates on the aetiology and management of cancer, reflecting recent discoveries. New material also includes the impact of bisphosphonates, and new approaches to the management of Class III malocclusions in the growing child. Sections on the differences in healthcare and legal requirements of the UK devolved countries have been added, and all life support protocols have been updated. 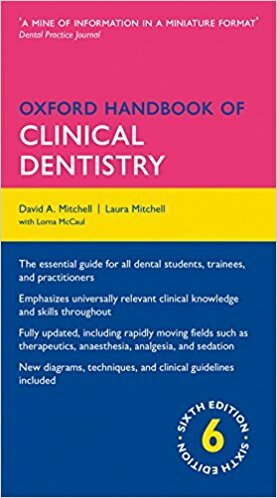 This concise and practical distillation of the essential knowledge and skills for dental practice has been highly regarded by dental students and practitioners for over twenty years. Now it is more vital than ever for you to ensure the most up-to-date edition is always close to hand!